KEY POINTS  Posthumous gamete (sperm or oocyte) procurement and reproduction are ethically justiďŹ able if written documentation from the deceased authorizing the procedure is available.  Programs are not obligated to participate in such activities, but in any case should develop written policies regarding the speciďŹ c circumstances in which they will or will not participate in such activities.  In the absence of written documentation from the decedent, programs open to considering requests for posthumous gamete procurement or reproduction should only do so when such requests are initiated by the surviving spouse or life partner.  It is very important to allow adequate time for grieving and counseling prior to the posthumous use of gametes or embryos for reproduction. In general, decisions concerning whether or not to have a child have been considered private and a fundamental right of individual adults. In part, this is because of the importance to individuals of having and rearing their own children. The case of posthumous reproduction, however, is different in a number of respects. First, the deceased obviously will not be able to rear the child. This raises the question as to whether an individual can have an interest in reproducing, even when rearing is not possible, and further, as to whether such an interest ought to be respected. The possibility of posthumous reproduction also raises the question as to whether an individual can have an interest in not having offspring come into existence after his or her death, and if so, how this interest should be weighed against the interest of the surviving spouse or life partner who wants to reproduce with the deceased's gametes. * Download a free QR code scanner by searching for â&#x20AC;&#x153;QR scannerâ&#x20AC;? in your smartphoneâ&#x20AC;&#x2122;s app store or app marketplace. We begin with the question of whether an individual's interests can ever be said to survive his or her death. Fertility and Sterility® a prima facie right of individuals to control posthumous reproduction. Recognition of such a right is reﬂected in the fact that assisted reproduction programs have consent forms that stipulate the disposition of gametes and embryos after the death of one or both of the individuals who contributed to the gametes and embryos. IS THERE A RIGHT TO REPRODUCE POSTHUMOUSLY? Despite the interest that most people are likely to have in whether their biological offspring are brought into the world after their death, it has been argued that a right to reproduce posthumously can be said to exist only if posthumous reproduction implicates the same interests, values, and concerns that reproduction ordinarily entails (2). This would seem not to be the case, because most of the experiences that give reproduction its meaning and importance to individuals are by deﬁnition unavailable in the case of posthumous reproduction. The dead cannot experience gestation or participate in rearing. The only remaining interest is the knowledge that a genetically related child might be born after the individual's death. Thus, it has been argued that this interest is ‘‘... so attenuated that . it is not an important reproductive experience at all, and should not receive the high respect ordinarily granted core reproductive experiences when they collide with the interests of others’’ (2). This interest is not sufﬁciently attenuated, however, that it can be dismissed if a spouse or intimate partner shares it. This situation contrasts with that of individuals with an interest in posthumous reproduction who die without an intended partner. In this case, the attenuation of the interests of the deceased is not mitigated by the shared aspiration of a surviving partner, and the case for further preservation of frozen gametes or harvesting of gametes is far less compelling. complying with requests for utilization of frozen gametes or for postmortem gamete harvest than when there is a clear record of the wishes of the deceased. ASRM PAGES that the consent forms that patients sign when freezing sperm, oocytes, or embryos include speciﬁc directions regarding the use of their gametes or embryos after their death. Fertility and Sterility® clinicians. While this document reﬂects the views of members of that Committee, it is not intended to be the only approved standard of practice or to dictate an exclusive course of treatment in all cases. This report was approved by the Ethics Committee of the American Society for Reproductive Medicine and the Board of Directors of the American Society for Reproductive Medicine. This document was reviewed by ASRM members and their input was considered in the preparation of the ﬁnal document. The following members of the ASRM Ethics Committee participated in the development of this document. All Committee members disclosed commercial and ﬁnancial relationships with manufacturers or distributors of goods or services used to treat patients. Members of the Committee who were found to have conﬂicts of interest based on the relationships disclosed did not participate in the discussion or development of this document. Paula Amato, M.D. ; Robert Brzyski, M.D., Ph.D.; Jean Benward, L.C.S.W. ; Andrea Stein, M.D. ; Bonnie Steinbock, Ph.D.; Bruce Wilder, M.D., M.P.H., J.D. ; Leslie Francis, Ph.D., J.D. ; Richard Reindollar, M.D. ; John Robertson, J.D. ; Judith Daar, J.D. ; Senait Fisseha, M.D., J.D. ; Steven Ralston, M.D. ; Mark Sauer, M.D. ; Monique Spillman, M.D. ; Robert Rebar, M.D. ; Sean Tipton, M.A. Feinberg J. Harm to others. New York: Oxford University Press; 1984:18. Robertson JA. Posthumous reproduction. Indiana Law Journal 1994:1027–65. Batzer FR, Hurwitz JM, Caplan A. Postmortem parenthood and the need for a protocol with posthumous sperm procurement. Fertil Steril 2003;79:1263–9. Landau R. Posthumous sperm retrieval for the purpose of later insemination or IVF in Israel: an ethical and psychosocial critique. Hum Reprod 2004;19: 1952–6. Practice Committee of the American Society for Reproductive Medicine, Practice Committee of the Society for Assisted Reproductive Technology. Ovarian tissue and oocyte cryopreservation. Fertil Steril 2006;86(Suppl 4): S142–7. Centers for Disease Control and Prevention. Ten leading causes of death and injury. Available at: http://www.cdc.gov/injury/wisqars/LeadingCau ses.html. Accessed January 19, 2010. Kerr SM, Caplan A, Polin G, Smugar S, O'Neill K, Urowitz S. Postmortem sperm procurement. J Urol 1997;157:2154–8. Human Fertilisation & Embryology Authority. Explanation of court of appeal's judgment in the Diane Blood case, 17/02/1997. Available at: http://www.hfea.gov.uk/3247.html. Accessed January 19, 2010. Ravitsky V. Posthumous reproduction guidelines in Israel. Hastings Center Report 2004;34:6–7. Tash JA, Applegarth LD, Kerr SM, Fins JJ, Rosenwaks Z, Schlegel PN. 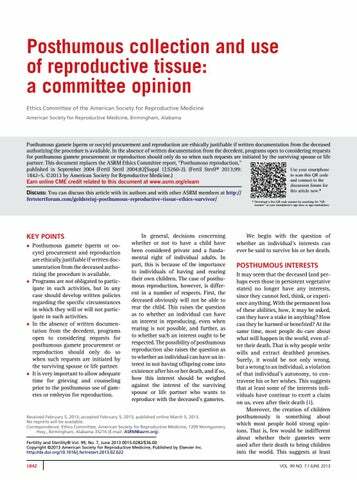 Postmortem sperm retrieval: the effect of instituting guidelines. J Urol 2003;170:1922–5. Rosoff PM, Katsur ML. Preserving fertility in young cancer patients: a medical, ethical and legal challenge. J Phil Sci Law 2003;3:1–16.